The title of this post is for a reason. I was speaking to a group of young kids yesterday about what they are doing for spring break etc. One was telling me about a time he went to a friends house and they had a pellet gun and just shot things. I asked, “What did you shoot?”. He replied, “Just birds”. Even though I love birds, I was not angry with him at all. He is just a child and his response was naive. I tried my best to explain that they also have companions and young families at times and they are missed too. Eventually tired of my lecture, he said. “They are just birds!”. Now I am no tree hugger or holier than though type, nor was I angry with him. I was actually sad. You see I was the same. I grew up in South Africa on a small little farm / small holding and I would trail my brother as he had his pellet gun and take pot shots at birds. We knew no better. I was only sad if he shot the small ones, because I liked those ones. And I was again sad yesterday, as I thought us folks as elders don’t nearly do enough to teach our young the importance of all life on this planet, that we share it and we need to appreciate all of it. We all have our own little purpose and we should be appreciating the beauty of nature, not just killing it for fun or out of boredom or because we want to replicate all the killing in video games. If we hunt for food, that is a different story. Like I said in one of my previous posts, I wish our kids were taught more of this type or appreciation or values in schools, rather than memorizing battle dates and such. I am not sure what type of bird this is, but I “shot” (excuse the pun) this whilst waiting for a cardinal and or blue jay. But I thought he deserved the credit for being just as beautiful. Hopefully he avoids any pellet pot shots in the future. You are right…and the bird looks like a robin to me (I’m not an expert)! Great post and a beautiful bird … all God’s creatures. It is a beautiful photo of a N. American Robin whose keen sense of hearing allows them to actually hear earthworms (their prey of choice) moving beneath them. Here In British Columbia’s Interior they don’t arrive until around mid-March and then depart around mid-October. Your story raises many worthy points of discussion. The Robin is known as being hyper-territorial and will go after any other Robin within its self-designated space. Of course, Robins themselves have their predators, and those predators have theirs. At some point humans are also animals, though we like to think we can control our instincts. So far, though, we’ve been unable to curb our tendancies towards violence, on state sanctioned levels and/or other ones as well. That said, I hope the little kid will choose tin cans instead . . . . I hit a male robin while driving to work yesterday, and was very sad, knowing I had killed him. He may have been a migrant still on his way north, or he may have been a local bird who may have already chosen a mate for the season. Either way, I never think of them as “just birds”– each creature’s life is significant. But I am an avian field biologist so naturally it follows that I think birds are special. 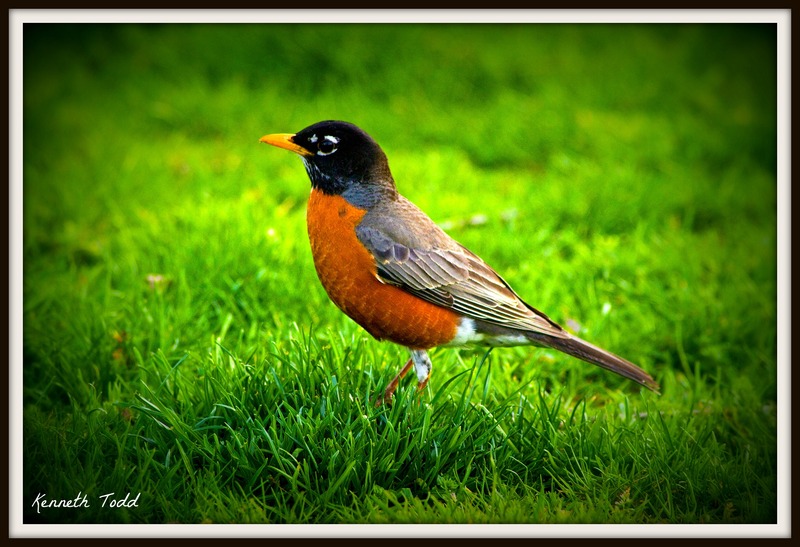 I like the vignetting in your photo; the robin really stands out nicely. Your beautiful robin looks so noble…I’m glad you introduced the boy to the idea that all life is sacred. Happy Earth Day! Your perception of modern arse-faced-education unfortunately rings true. I adore birds. My favorite is the mockingbird. This little white, gray and black bird is oozing with personality, plus they are the state of Texas’ bird where I live. I’m sad to know that kids think that way, I really wish as well, thgat they were thaugh more about how nature is important for our world. Beautiful photo Kenneth, love the colors. Impressive Kenneth … photo and subject ! I was going to give you the name of your bird but I see in the comments that you already have it. A few years ago I was volunteering with Project Wildlife which rescues injured animals, rehabilitates them, and releases them back into the wild. During our orientation, an injured song sparrow was brought in. One of the new volunteers looked at it and said, “It’s just a sparrow.” We received a 5-minute lecture on the word “just” as it relates to wildlife. The volunteer did not come back. Tks for sharing your story.